Call us today at (586)263-9930! If you are in need of top rated Macomb County Carpet Cleaning, please contact Duo-Care Cleaning & Restoration at (586) 263-9930 to setup an appointment today! Click here to learn more about our carpet cleaning services or Follow Us on Facebook! If your house has carpet, there’s no getting around it: You’re going to have to get it cleaned. Carpet is among the most beautiful and comfortable of flooring options, but also one of the most high maintenance ones out there. If you want your carpet looking tip-top, you’ll need to get it cleaned regularly. Carpets can be a hotbed for allergens. From dust mites to pet dander and pollen and beyond, all sorts of tiny particles can get stuck in the carpet fibers, just waiting to be disturbed by your footsteps so they can circulate in the air and set off your allergies. Some of these allergens can get stuck deep in the carpet fibers and become very hard to ferret out with vacuuming. A professional carpet cleaning will eradicate the allergens in your carpet, giving your overworked allergies some sweet relief. Dirty carpets can trap in odors like nobody’s business. They can especially start to stink if they get wet. Wet carpets that aren’t treated can develop mildew and mold over time. Not only does mold smell, it can pose a serious health risk if left to circulate in your air. This is the most obvious sign that your carpets need cleaning. Is it riddled with stains? Does it look blotchy and worn down? Some stains can get so deep into your carpet that conventional cleaning products won’t clean them up. And in most cases, you’re better off not even trying to clean them on your own: The wrong cleaning products can permanently damage your carpets. 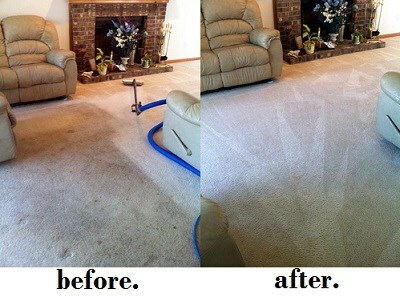 Carpet cleaning doesn’t just clean your flooring- It rejuvenates it. A cleaning can make an old carpet look brand new again. Carpets suffer wear and tear naturally over the years, especially if they get a lot of foot traffic. We all love our pets, but you may need to get your carpets cleaned more often if you have pets. Pets can have “accidents” on your carpets, they can drag themselves across it leaving all types of germs in their wake, they can tear it up with their claws and litter it with their dander. Pay attention to your pets: If they spend a LOT of time on your carpets, you will need to get them cleaned. For experienced and trusted Macomb County Carpet Cleaning, please call Duo-Care Cleaning & Restoration at (586) 263-9930. This entry was posted in Macomb County Carpet Cleaning and tagged Carpet Cleaners Near Me, Macomb County Carpet Cleaners, Macomb County Carpet Cleaning, Macomb County Carpet Cleaning Service on February 22, 2019 by Duo-Care. Many homeowners believe all they need for carpet cleaning is a vacuum and store-bought cleansers. But did you know even the most popular DIY carpet cleaning methods don’t tackle tough stains and deep cleaning like a professional. A photo of our professional cleaning! 1. You have children and pets. If you’re a parent, you probably know the feeling of defeat after a paint spill or dirt tracks find their way into your house five minutes after vacuuming. And if you own indoor/outdoor pets, you’ve probably dealt with hefty amounts of drool, mud or tiny “surprises” lurking within your home. If this sounds similar to the weekly routine in your household, you’re probably in need of a professional carpet cleaning. Even the most expensive vacuums and cleansers won’t completely remedy those small disasters. If you have allergies, dust, pollen and other particles present in your carpet are even more harmful to your health than normal. A deep carpet cleaning removes and prevents the buildup of allergens and bacteria, and even tackles pesky dust mites or bedbugs that may have created homes in your carpets – gross! 3. You can’t get rid of those tough stains. If you have tough stains that just don’t seem to come out, don’t lose all hope. Trained carpet cleaning professionals have the specialized tools, products and equipment you need to finally rid your carpets of what seem to be permanent stains. Plus, removing these soils, spots or stains promptly will help protect your carpet from future extensive damage. 4. You want easier maintenance. 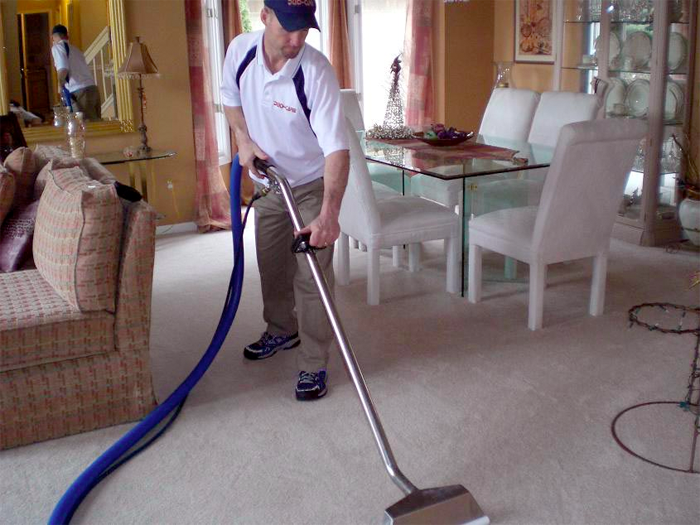 It is recommended to hire a professional to perform carpet cleaning at least once a year. Annual carpet cleanings allow for easier maintenance on a normal day-to-day basis, allowing for a less time consuming and stressful upkeep routine. 5. You want that “brand new carpet” look again. This entry was posted in Macomb County Carpet Cleaning Service and tagged Carpet Cleaners Shelby Twp MI, Macomb County Carpet Cleaners, Macomb County Carpet Cleaning Service on August 20, 2018 by Duo-Care. If you are in need of professional Macomb County Carpet Cleaners, please contact the experts at Duo-Care Cleaning and Restoration at (586) 263-9930. Click here to learn more about why we are the best Macomb County Carpet Cleaners! Follow Us on Facebook to stay updated with current information and special offers. Carpeting is a great alternative to hardwood flooring or tile. But, some people who are on the fence about making the right choice for their home or office will find that carpeting leaves a bad taste in their mouth because the upkeep alone is time consuming. It’s a given fact that we all are constantly receiving new information and gathering facts. And, this is what disregards myths which influence our decisions, even if it is pertaining to tastes in flooring. Below you will find ten of the most popular myths debunked about carpet cleaning that could sway your decision before heading to the nearest home improvement store purchasing something other than carpet. Urban legends be gone! False! Many carpet cleaning companies use hot water extraction, aka steam cleaning. It is the preferred choice because when done properly, it cleanses thoroughly. It is highly recommended by the leading carpet manufacturers worldwide, and untrained professionals who treat the carpet with this method can create a variety of problems that are not needed. 2. If the carpet doesn’t look dirty, do I still have to clean it? Yes, you do! Some carpets do camouflage more dirt than others, but it doesn’t mean that there isn’t any soil to be removed. Whether hidden or not, all dirt acts as an abrasive which can sadly result in loss of fiber protection and color, and early wear. 3. My carpet isn’t even a year old yet, does it still need to be cleaned? This is one of the most common mistakes for carpet owners, and can prove to be very costly. Even though some dirt doesn’t appear on the surface, it does not mean that it’s not dirty. By the time soil is visible to the naked eye, most of the damage has already occurred. Grime could break the fibers down at a quickening pace, which prompts you thinking a new one needs to be purchased. Untrue! These scented powders are harmful for your carpet as well as create unnecessary dust in your home. It is nearly impossible to vacuum up all that is sprinkled into the carpet and therefore leaving some in the carpet which when disturbed becomes dust in your home. While this used to be true years ago, today this is rarely the case. A trained technician using professional products should not leave any dirt attracting residue in your carpet to cause it to rapidly resoil. Again, this is not something to worry about, because most homeowners find vacuuming to be a tedious chore. There’s even one on the market which does it for you while you keep your feet propped up on the coffee table! Vacuuming can actually remove more than half of all sorts of dirt embedded within your carpet. Even if one vacuums every day, twice a day, it will not cause harm to any type of carpet, but who’s going to do that. Most homeowners purchase, or rent their own unit to get the job done. But, doing it yourself could possibly be the most harmful act done to your carpet. They’re good for putting a lot of water in to the carpet, but not taking it out. Which results in hours of drying time, and leaving it an open gateway for mildew, mold and bacteria to grow. Leave it to the professionals who use the heavy-duty machines and have the proper training. No, you can’t. This is a huge mistake made by consumers daily. It is not a good investment in the long run because it takes only months for dirt to become visible which in turn can cause premature and permanent damage which is irreversible. Don’t delay, clean it today! Indoor air quality will be ruined, and could cause health problems for family, friends and even your pets. If a carpet is cleaned regularly and correctly, your home or office environment will prove to be more beneficial in many ways. There are many studies showing that clean carpet will actually trap and hold the allergens and not allow them to get up into your breathing zone like they would if they were on a hard surface floor. If you are searching for expert Macomb County Carpet Cleaners, please call Duo-Care Cleaning and Restoration at (586) 263-9930. This entry was posted in Macomb County Carpet Cleaners and tagged Carpet Cleaners in Macomb County, Carpet Cleaning Macomb County, Macomb County Carpet Cleaners on July 12, 2018 by Duo-Care. Very pleased with the team at Duo Care! They were prompt, courteous, and exceeded expectations. Will be using them again! Professional, kind, and the work speaks for itself. Big shout out to Mike and Sam for the incredible attention to detail. We woke Christmas Day 2017 to water in our basement. I called Duo Care the next morning. Joe was at our house by Noon and got to work. He was prompt, professional, courteous and insightful, informing us every step of the way about what he was doing and why. The basement was dry and nearly back to normal by the end of the week. I highly recommend Duo Care. They did a great job not only on our carpets but my wood floors also.Everthing looks so nice. I'm so happy with the job that Jeff from Duo Care did on Living rm, dining rm, stairs and hallway today. He worked hard and was very professional. Thank you so much!